Two clear and distinct types of corrosion include dry corrosion i.e. corrosive action without the presence of moisture and wet corrosion, involving the transfer of electrons during oxidation and reduction. Corrosion is defined as the deterioration of a material by chemical or electro chemical reactions with its environment. Due to corrosion the useful properties of a metal like malleability, ductility, electrical conductivity and also the surface appearance are compromised. The most familiar example of corrosion is the rusting of iron when exposed to atmospheric conditions. There are several types of corrosion, including wet corrosion and dry corrosion. Dry corrosion occurs when there is no water or moisture to aid the corrosive process, and the metal oxidizes with the atmosphere alone. Wet corrosion of metals occurs through electron transfer, involving two processes, oxidation and reduction. In oxidation, the metal atoms lose electrons. The surrounding environment then gains the electrons in reduction. The metal, where electrons are lost, is called the anode. The other metal, liquid or gas which gains the electrons is called the cathode. Air contains, on average, 21% oxygen, 78% nitrogen, and 1% argon. It can also contain water vapour, ozone, and carbon dioxide. Water is very commonly aerated which again means there is oxygen available for reaction with metals. There are many factors that dictate how corrosive an environment is. One is the amount of oxygen available to form corrosion products or the presence of water or moisture which greatly accelerate the rate of corrosion. Another is the presence of other elements, ions and compounds that can limit or enhance corrosion rates. Therefore corrosion rates are often considered in different atmospheres: industrial, rural and marine. Each of these environments will contain different amounts of oxygen and other “pollutants” like ozone, salt, dusts, sulphur dioxide, ammonia, hydrogen and hydrogen sulphide. (Cathode reaction: consumes electrons; electron sink reaction: reduction). Electrons liberated in the anode reaction A flow to the site of the cathode reaction C through the conducting metal. The movement of dissociated ions carries an equal ionic current in the water. The distances over which these currents flow can vary from microns to many metres. All wet corrosion processes can be analysed in terms of anodic and cathodic reactions. The anodic process is the direct cause of damage to metallic structures but both an anodic and a cathodic process must occur for a corrosion cell to be formed. 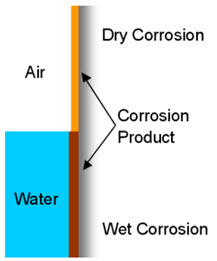 The corrosion of metals by reaction with air and water to form metal hydroxides as shown above is a very important wet corrosion process, especially in the construction industries. There are other corrosion reactions resulting from, for example, other cathode reactions (electron-consuming). All wet corrosion processes can be analysed in terms of anodic and cathodic reactions. At this stage, a steady potential difference now exists between metal and solution. The magnitude of this potential difference depends on the metal and composition of the solution. It is not possible to measure this potential difference for a single metal, but the potential difference (emf) between two metals dipping into a solution can be measured. Under well-defined conditions, this enables a single potential Em (relative to a common reference) to be assigned to every metal.